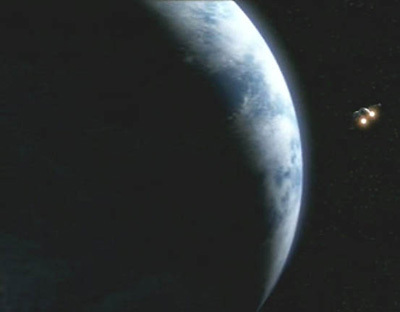 Kamino is the fifth planet in the Kamino system. The system itself was actually part of a dwarf satellite galaxy that spun within the known galaxy, some twelve parsecs to the south of the Rishi Maze. Purged from the otherwise complete Jedi Archives is all evidence of the mysterious world of Kamino. A lonely world beyond the Outer Rim, few could have predicted that Kamino would become a key contributor to a massive shift in political power in the waning days of the Republic. Kamino is a planet of tumultuous oceans and endless storms. Kamino has never recovered from the global warming that melted huge shelves of inland continental ice. Its oceans swelled, covering the landmasses, forcing the native Kaminoans to adapt. Their stilt cities echo their former land colonies, but are built to withstand the ceaseless storms that buffet the world. The Kaminoan partnership with the Galactic Republic to provide its Grand Army suddenly thrust the rain-veiled world into a more public spotlight than it ever had before. It became the subject of early Separatists attacks during the Clone Wars, with Mon Calamari Commander Merai leading a joint space and surface attack on the planet. Intelligence gathered by Quinlan Vos tipped the Republic to this impending strike, and they were able to scramble a mission of Jedi protectors to defend this crucial world. As the Clone Wars progressed, Republic cloning operations began to spread elsewhere. The vaunted Kaminoan obsession for introverted secrecy was irreparably compromised as their proprietary techniques were soon being carried out and built upon by Republic cloners. Entire hatcheries were transplanted offworld, and Kamino began to lose what little leverage it had over the Republic. The planet was again the target of violence, as the fervent Mandalorian Protectors rained destruction upon a number of Kaminoan cities in a Separatist-backed Battle Legionnaire droid army attack that left the cloners reeling. The emergent Empire nonetheless kept a strong presence on Kamino -- at the very least to keep the planet's valuable technology from falling into the wrong hands. Some Kaminoans, holding the Empire solely responsible for the Kamino's woes, began surreptitiously cultivating a liberation army of Kamino-loyal clones who would oppose the Empire. The resultant clone uprising, which occurred about a decade into the Empire's rule, was put down by the elite 501st Legion of stormtroopers. The master of this Legion, Darth Vader, hired a special mercenary to lead the troopers in battle: Boba Fett, a product of the Kaminoan hatcheries.